Page 1 is the student worksheet. 1. How long is the closet in the master bedroom? 2. Draw a queen size bed (60 in x 80 in) in the master bedroom. 3. 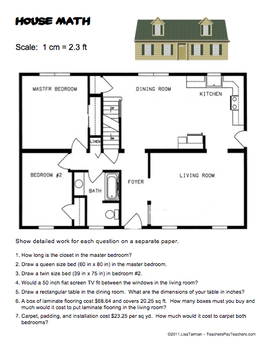 Draw a twin size bed (39 in x 75 in) in bedroom #2. 4. Would a 50 inch flat screen TV fit between the windows in the living room? 5. Draw a rectangular table in the dining room. What are the dimensions of your table in inches? 6. A box of laminate flooring costs $68.64 and covers 20.25 sq ft. How many boxes must you buy and how much would it cost to put laminate flooring in the living room? 7. Carpet, padding, and installation cost $23.25 per sq yd. How much would it cost to carpet both bedrooms? 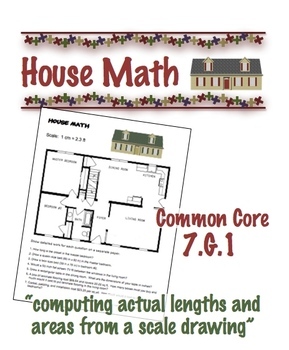 NOTE: This activity was specifically designed for Common Core standard 7.G.1, but it does NOT reference the standard or grade on the student paper. Some teachers have found this to be very challenging for 7th grade, but I believe it reflects the level of rigor for which we should aim. Measurements are made to the nearest .1 cm. Some classes may need some prior scaffolding.